A 96-year-old Holocaust survivor appealed to Polish authorities to “take radical measures” in the fight against neo-Nazi organisations in Poland. Magdalena Wyszyńska, a Polish-born Jew living in Lviv, Ukraine, spoke Saturday during at an anti-fascist counterdemonstration in Gdansk organised by its mayor, Paweł Adamowicz. 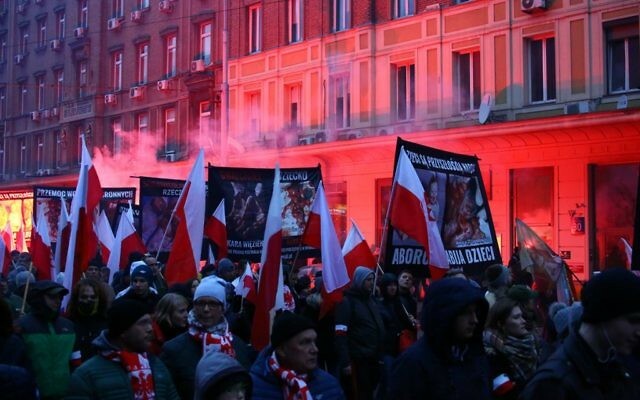 Some 1,500 people attended the counterdemonstration in response to a march in the Polish city last week by extreme right-wing groups. Adamowicz said history should serve as a warning and a lesson. Also on Saturday, the Internal Security Agency and the police carried out a raid in Dzierżoniów, in southwestern Poland, to detain people associated with neo-Nazi movements and prevent a nationalist concert that was timed to coincide with Adolf Hitler’s birthday. Areas of the town were paralysed for several hours, and police did not allow residents to leave their homes amid fears that the neo-Nazis could be armed and pose serious danger.